For the finest gutter protection system on the market, homeowners in Joplin, Missouri, can turn to ABC Seamless Siding & Windows. 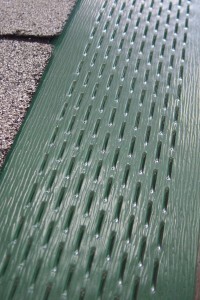 We proudly install the Hurricane Leaf Protector™, an exclusive ABC Seamless product. This system will help your gutters function better and channel water away from your home more effectively. Plus, the tedious and even potentially hazardous chore of climbing up a ladder to clean debris out of your gutters will be eliminated. With the Hurricane Leaf Protector™ installed, this debris is instead washed harmlessly to the ground. Without these items causing potential clogs in your gutter, your home is not susceptible to pooling water around the foundation, which can cause a host of problems including landscape erosion and basement flooding. Similarly, our gutter protection system keeps water from pooling on your roof, preventing problematic and costly roof rot. To learn more about having the superior gutter protection offered by the Hurricane Leaf Protector™ installed on your home in Joplin, MO, contact ABC Seamless Siding & Windows today. Be sure to also ask about our seamless steel gutters, which are more durable and channel more water away from the home than standard aluminum gutters.